David Billings and I went to Glinks Gully on Easter Sunday. It was like Queen street on a Friday night, kites everywhere, and not many beach manners being adhered to. For example, my Nighthawk Kite was out about 1000 metres and some drongo who had a funny shaped kite which was not tackable set his rig on a hell of an angle which would have crossed my gear even though he was well away from me. I had to stop fishing and pull in my gear. Anyway, the end result between us was 1 kahawai, 1 gurnard and 9 snapper up to 1.5kg. It was an incoming tide of around 3.5 metres, the winds were northeasterly and variable between 8 and 15 knots. On another note, I tried to check out the Forest & Bird submission site for proposals and my computer froze up. I couldn't get to the site and I couldn't click off! I wonder if it's my computer or it's been done on purpose? 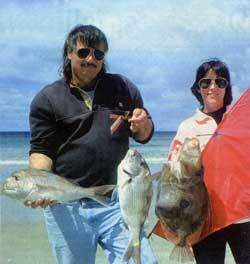 File Photo : Paul and Peggy Barnes with three fish from five hooks taken on a flexiwing kite rig at Pakiri Beach. John dory are a frequent surprise here. We are receiving a lot of calls from people wanting to know when the line haulers will be available so I thought I would let you all know the status of them. We have beach tested two prototypes, made quite a few adjustments and improvements to the design and now have an engineering company making a mould for us. Unfortunately the engineering company had a break down on their machinery and have a back log of work to get out before they can get back to our line hauler. So, as soon as we receive the product we will be out doing the final trials before going into production. We will keep you informed as to the progress and also let you know how the initial trials go with the final prototype. Wayne, fishing a dropper rig on an incoming tide in the Port Taranaki area set five hooks and caught one gurnard and a kahawai. Wayne was using mackerel for bait, the wind was a moderate southeasterly and the surf and rip was slight. Recently I have read conflicting advice relating to the legal aspects of using fishing kites. Could you please advise the correct information relating to the following questions or point me in the right direction to find out this information? What is the maximum height that a fishing kite may be flown? What is the distance from an airport or airstrip within which a fishing kite must not be flown? Does a flexiwing or other dropper rig require a flag to be flown above the float in the way a bottom long line kite rig does? Are there any other points or regulations that need to be observed relating to kite or long line rigs? ED: In response to question 3, a flag on a dropper rig is advised by the Marine Transport Authority for kitefishers who fish in areas where boats operate. This is a recent development, and allows kitefishers who get cut off by vessels not keeping an adequate watch, to possibly claim against the skipper if cut off by the vessel. The reverse is true if a boat is damaged by an unmarked kite, kontiki, raft or submarine. I don't think there is much chance of a dropper rig damaging a vessel but kontiki raft and submarine operators should ensure their gear is well marked. Bag type kontikis are highly visible and shouldn't need any additional marking. The following article appeared in the civil aviation magazine and answers important issues raised by Lindsay, it's an interesting read. From the Civil Aviation Authority magazine "VECTOR"
Kites come with strings attached. That is part of the problem. The 'strings' can be nylon with breaking strains of between 50 and 65 kg. Fishing kites can have a span of up to 2.3 metres with carbon fibre frames or be of a 'power -sled' type (like a parasail) with about 2 square metres of sail area. The weight of the most popular types is about 200 grams. Fishing kites present a small, but real, risk to aircraft at low level around coastal areas of New Zealand. 'Kontiki' fishing has long been popular off beaches around the New Zealand coast. It is generally undertaken with favourable offshore winds. Kontiki or raft fishing involves setting a line through the surf with a floating bag or raft being drawn off shore by a favourable wind, towing out a rigged long-line of baited hooks or lures. Kite fishing dispenses with the 'raft' and utilises enlarged kites and sails to take a fishing rig out through the surf. Modern fishing kite designs have the ability to 'tack' and can be flown up to 90 degrees either side of the wind. This means that you can find a fishing kite up to 1500 metres off shore when the wind is blowing along the coastline. The popularity of kite fishing has increased dramatically over the last ten years, and it is estimated that there are now about 30,000 people involved. The fact that kite fishing can be undertaken in wind conditions not possible a few years ago, and the rapid increase in people involved in the activity, means the likelihood of finding a fishing kite along the coast is significantly higher than it was, and it is likely to increase further. Civil Aviation Rules, Part 101 Gyrogliders and Parasails; and Unmanned Balloons, Kites, Rockets, and Model Aircraft - Operating Rules includes requirements for the operation of kites (and moored balloons). There is an over-riding requirement that a person shall not operate a kite (or balloon, model aircraft, gyroglider or parasail) in a manner that creates a hazard to aircraft or to persons or property. A kite may not be flown in any circumstances on or over an active aircraft movement area or runway. A 'shielded operation', ie, within 100 metres of a structure and below the top of the structure, is exempt from the following requirements. This allows for kids (of various sizes and ages!) flying their kites in the local park. A kite may not be flown in controlled airspace and in most special use airspace without appropriate approval, except in the case of low-flying zones, where they are prohibited. They may not be flown within 4 km of an aerodrome boundary without authorisation of ATC in the case of a controlled aerodrome, or in accordance with an agreement with the aerodrome operator for an uncontrolled aerodrome. There are also requirements for distance from cloud and for visibility. One can appreciate that the rule was written to offer a measure of protection from a kite encounter at or near aerodromes and to cater for kite flying higher that 400 feet agl now and then, which would be advised by NOTAM. However, with the advent of quite sophisticated large high-performance fishing kites, there are a few very real and practical problems. It may be considered unlikely that many users of fishing kites will know of the existence of CAR Part 101, nor understand the boundaries and implications of various airspace - which makes it all the more important for pilots to be aware of the hazard these kites can pose. One of the newer fishing kites has a combined kite line and mainline length of 1000 metres (or 3280 feet). Depending on the wind strength, line weights, number of hooks, and the parabolic curve of the line out of the water to the kite, the actual kite height could vary over quite an altitude range, certainly possibly above 400 feet agl. "He immediately started to wind in the kite from an estimated height of 200 feet when one of the aircraft collided with it..."
Other kite-fishing models indicate line lengths of 50 to 100 metres (or 164 to 328 feet). If it is a good day for kite fishing, with a suitable wind, then it is likely the fishing folk will be off to the beach to set up and launch. It is most unlikely that they will be thinking in terms of our aeronautical rules and requirements. Thoughts about coastal aviators may only come to mind when either the person fishing or the pilot has had a fright. Yes, there have been some! In the last six years there have been over 80 reported occurrences involving kites. In some cases they involve children (or adults) flying ordinary kites near aerodrome takeoff and landing paths, such as at the edge of Lake Wakatipu on the threshold of Runway 05 at Queenstown airport, where there have been a number of reported occurrences. There have also been two instances of children flying kites at 800 to1000 feet in the Palmerston North circuit area. Most, however, involve fishing kites flown from coastal areas around the country. Some of these beaches are close to aerodromes, with incidents reported at Tauranga, Napier and Gisborne - all controlled aerodromes. It is likely there have been other unreported occurrences at uncontrolled aerodromes. There have also been occurrences at beaches in the Auckland, New Plymouth, Tauranga and Hawkes Bay areas. It is probably safe to assume that there have been a number of unreported incidents where the circumstances have been such that reporting the incident would be embarrassing for the pilot. Fishing sources say their biggest concerns have been caused by aircraft flying at a very low level. One reported incident early this year came from a person who was fishing off a beach south of Whangarei when he saw a formation of four biplanes approaching at very low level. He immediately started to wind in the kite from an estimated height of 200 feet when one of the aircraft collided with it and carried on. "Modern fishing kite designs have the ability to 'tack' and can be flown up to 90 degrees either side of the wind." The Manawatu west coast is a popular Kontiki and fishing kite area. Access to these wide black-sand beaches is not difficult. Mid-way along this coastal area, the Raumai Range (M303) extends in a circle approximately five nautical miles inland and the same distance out to sea from the surface to 11,000 feet. It is a major RNZAF weapons training area, with Skyhawk, Macchi and CT4 operations. High-speed target runs are made down to very low levels. In mid 1998 a Macchi had a very near miss with a large fishing kite. The Macchi would probably have broken the line, but the ingestion of all or part of the kite into the gas turbine intake could have been catastrophic. Both the pilot and the fisherman were shaken. The latter had no idea as to the 'requirements'. Fortunately, following this incident there was good liaison between Ohakea ATC and the local fisher-folk with these new large kites, and appropriate notification arrangements have been entered into. At Gisborne, the airfield elevation is 15 feet amsl, and the approach to Runway 32 is over the Waikanae Beach. Similarly, the departure from Runway 14 is straight out to sea. In the recent past there have been a number of fishing kite incidents at the coastal threshold to this runway. Gisborne ATS have attempted to exercise the authority indicated in CAR Part 101, because this fishing activity is well inside the airspace boundary. Some heated exchanges have taken place, with people suggesting it is their 'right' to fish by these means where and when they want to, without regard to the hazard to approaching and departing aircraft (which include commercial passenger flights). Auckland International Airport also had an incident this year, with a kite at 200 feet agl on the approach path just 2 NM from touchdown. This is not the sort of distraction a crew need, nor ATS, during this critical flight phase. Alongside these recent 'near-miss' incidents, there are also informal reports of light aircraft arriving at an airfield trailing lengths of kite line. These have been hooked around undercarriage legs and tailplanes. To date there has not been a clearly identified accident from a direct 'kite strike' in New Zealand. But we have had some near misses and frights. The risk is there, however, with kites of increasing size, and with lines of greater strength and length. With increasing kite size and structural strength from modern materials, a direct 'hit' may damage the aircraft structure, visibility may be masked, controls jammed by debris, or the engine intake(s) blocked, resulting in power loss. A strike on the kite line itself may do little structural damage; the major hazard would be a control surface jam. Since a strike would be at a comparatively low altitude, pilot response would influence the outcome. Spread out the New Zealand 1:500 000 Aeronautical Charts, and it becomes clear that there are a quite a few aerodromes literally on the coast. Many have runway arrival and departure tracks over the sea or a circuit pattern that can be 'on the coast'. If the beach is suitable, accessible, and the winds favourable, it may be a location where kite fishing could suddenly appear. Coastal route VFR navigation by light aircraft is popular. It makes navigation 'easy', and terrain is less of a consideration. In the North Island, transit via the west coast is common. In the South Island both the east and west coasts provide good VFR flying routes. Fishing sources tell us that the coastal areas of the top half of the North Island (from Egmont to North Cape and from North Cape to East Cape) would have ten times the kite fishing activity of other areas. In the South Island, Birdlings Flat on the east coast south of Christchurch is a popular kite-fishing spot. In the lower half of the North Island, areas along the Hawkes Bay and Manawatu coastlines are popular. The latter happens to also be the main VFR north-south route. In Class G airspace, the practical protection is not to fly below the VFR minimum altitude, namely 500 feet agl. In theory, kites above 400 feet agl should be advised by NOTAM. Whether or not this has happened and pilots have actually read the NOTAM is another matter. That aside, the altitude minimum is a first protection. Flying higher is better. So seriously consider the risk of flying low level along the beach. Fishing kites and their lines can be up to 1500 metres off shore. Flying just inland, over the beach top would place you behind any kites. Alternatively you can go some distance out to sea, but this is less desirable with respect to remaining within gliding distance from land, and for visibility considerations if weather is the reason you are flying at a vulnerable height. Obviously, local knowledge about coastal kite fishing 'hot spots' is useful. Ask about this at an Aero Club or Flying School in the region. A sports shop may be an even better bet. But first and foremost, remember the foundation of VFR flying - see and be seen. Here the emphasis is on 'seeing'. If your route is in an area where there may be kite fishing, and you are at an altitude where there is a potential hazard, then look for kites. They are getting large, they are multi-coloured, and they may also have a flag on the line. And, as well as looking for the kite, look for the folk fishing. Clusters of vehicles on the beach are a clue to possible fishing activity - so too is the solitary car. If your eyes are really good you may detect the line reel on its pole on the beach. There is something else to be done also, and that is to educate kite users about our mutual safety concerns and interests. People are not going to stop fishing because we want to fly, and relatively few will know of CAR Part 101 or be affected by it, but none of us want an accident, an incident or substantial damage or loss to our gear. Some of these new big fishing kites can cost over $500, so there should be some interest in avoiding their loss or damage. It goes almost without saying that the costs to a pilot or an aircraft owner of a full-on 'kite strike' could be very much higher. It is possible that in future an appropriate symbol could be put on charts in the areas where the highest intensity of kite fishing takes place. To assist in gauging the extent of the problem, pilots should report kites that appear to be in a hazardous position to the local ATS unit and the CAA (call 0508 4 SAFETY). Likewise, fishing folk may report low-flying aircraft in the same way. 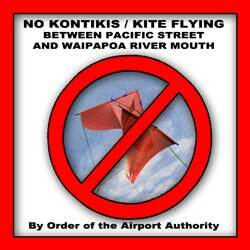 Thanks to Paul Barnes of Paul's Fishing Kites, Auckland for kite information and photos.